Sorry, but your specified filters didn't match any characters! BW 82 Clash of the Connoisseurs!ポケモンソムリエ対決!テイスティングバトル! !Pokémon Sommelier Showdown! A Tasting Battle!! BWS2 11 Unrest at the Nursery!ポケモン保育園は大騒ぎ! ワシボンとバルチャイ!Uproar at the Pokémon Nursery School! Washibon and Valchai! BWS2N 1 New Places... Familiar Faces!アララギ研究所！新たなる旅立ち！！The Araragi Laboratories! Setting Off on a New Journey!! BWS2DA 18 Survival of the Striaton Gym!デントＶＳ氷の挑戦者！ サンヨウジムの危機！！Dent VS the Ice Challenger! Crisis at the Sanyo Gym!! SM 1 Alola to New Adventure!アローラ！はじめての島、はじめてのポケモンたち！！Alola! New Islands, New Pokémon!! SM 6 びりびりちくちくトゲデマル！Zing Zap Togedemaru! SM 8 タマゴ係はだ～れだ？Who's in Charge of the Egg? SM 40 アシマリ、オシャマリ、いかりのダダリン！Ashimari, Osyamari and the An-chor-gry Dadarin! SM 46 Deceiving Appearances!変身メタモン、探すんだモン！C'mon, Search for the Transformed Metamon! Passes through the foe’s barrier and strikes. X They appear along with whirlwinds. They pull pranks, such as moving furniture and leaving balls of cotton in homes. X Sie erscheinen mit Orkanböen und spielen den Leuten Streiche, indem sie in Häusern Möbel verrücken oder Watte verstreuen. X Il apparaît dans un tourbillon de vent, s’introduit dans les maisons et y joue de mauvais tours. X Aparecen en medio de un torbellino y entran en las casas para descolocar los muebles o esparcir algodón por doquier. X Appare con un vortice d’aria, facendo piccoli dispetti come spostare i mobili nelle case o lasciare cotone ovunque. X 회오리바람과 함께 나타나 집 안의 가구를 움직이거나 솜을 남기는 장난을 친다. Y Like the wind, it can slip through any gap, no matter how small. It leaves balls of white fluff behind. Y Passiert wie ein Luftzug mühelos jeden noch so engen Spalt und hinterlässt dort nichts als ein weißes Fellknäuel. Y Il se faufile comme le vent par les espaces les plus étroits, en laissant une touffe de poils blancs. Y Es capaz de atravesar las más mínimas fisuras. A su paso, deja bolitas blancas de pelo. Y Si infiltra nelle fessure più sottili, come un soffio di vento, lasciando dietro di sé dei batuffoli bianchi. Y 아무리 좁은 틈이라도 바람처럼 빠져나간다. 하얀 털 뭉치를 남기고 간다. Omega Ruby Like the wind, it can slip through any gap, no matter how small. It leaves balls of white fluff behind. Omega Ruby Passiert wie ein Luftzug mühelos jeden noch so engen Spalt und hinterlässt dort nichts als ein weißes Fellknäuel. 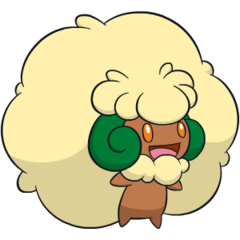 Omega Ruby Il se faufile comme le vent par les espaces les plus étroits, en laissant une touffe de poils blancs. Omega Ruby Es capaz de atravesar las más mínimas fisuras. A su paso, deja bolitas blancas de pelo. Omega Ruby Si infiltra nelle fessure più sottili, come un soffio di vento, lasciando dietro di sé dei batuffoli bianchi. Omega Ruby 아무리 좁은 틈이라도 바람처럼 빠져나간다. 하얀 털 뭉치를 남기고 간다. Alpha Sapphire They appear along with whirlwinds. They pull pranks, such as moving furniture and leaving balls of cotton in homes. Alpha Sapphire Sie erscheinen mit Orkanböen und spielen den Leuten Streiche, indem sie in Häusern Möbel verrücken oder Watte verstreuen. Alpha Sapphire Il apparaît dans un tourbillon de vent, s’introduit dans les maisons et y joue de mauvais tours. Alpha Sapphire Aparecen en medio de un torbellino y entran en las casas para descolocar los muebles o esparcir algodón por doquier. Alpha Sapphire Appare con un vortice d’aria, facendo piccoli dispetti come spostare i mobili nelle case o lasciare cotone ovunque. Alpha Sapphire 회오리바람과 함께 나타나 집 안의 가구를 움직이거나 솜을 남기는 장난을 친다. Sun It rides on the wind and slips into people’s homes. After it has turned a room into a cotton- filled mess, it giggles to itself and takes off. Moon This Pokémon appears, riding upon the wind. 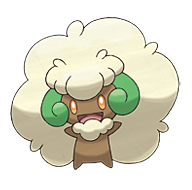 But if the wind gusts up, it’ll blow the cotton on this Pokémon’s head clean off. Black Like the wind, it can slip through any gap, no matter how small. It leaves balls of white fluff behind. White Riding whirlwinds, they appear. These Pokémon sneak through gaps into houses and cause all sorts of mischief. Black 2 They appear along with whirlwinds. They pull pranks, such as moving furniture and leaving balls of cotton in homes. White 2 They appear along with whirlwinds. They pull pranks, such as moving furniture and leaving balls of cotton in homes.